When we arrived at the taxi counter at Ngurah Rai International Airport, indicated taxi rate to our hotel is IDR200,000. With the fare way over than what we’ve expected, we went out of the arrival halls. 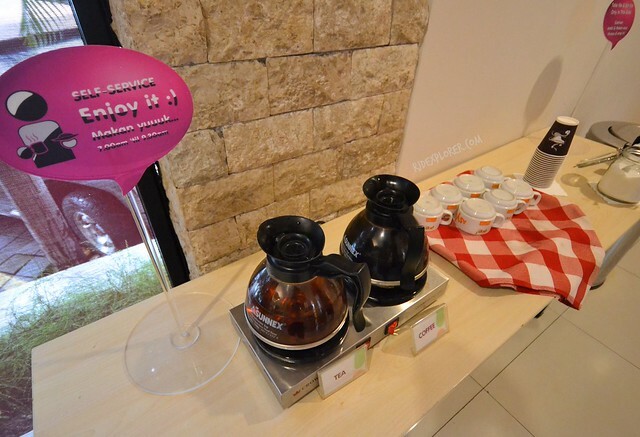 From the service crew of a convenience store, we confirmed that POP Hotel Teuku Umar is a little less than a 40-minute drive from the airport. We returned to the counter and booked a cab to our hotel located in the heart of Denpasar. Spell colorful. 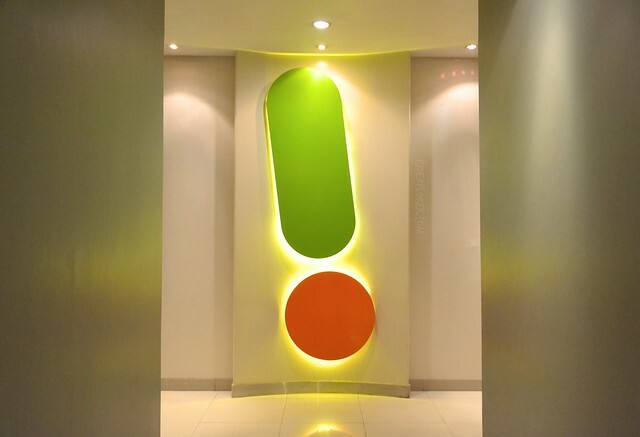 POP Hotel Teuku Umar’s lobby will spell it out for you. Around 10 in the evening, we arrived at the front-yard of the hotel. The security helped us unload our backpacks from the vehicle. The bright and colorful lobby welcomed us before we noticed the hotel crews wearing their green pop shirts. Some of them are not that fluent in English but we could see the struggle and effort from them just to communicate with us properly. 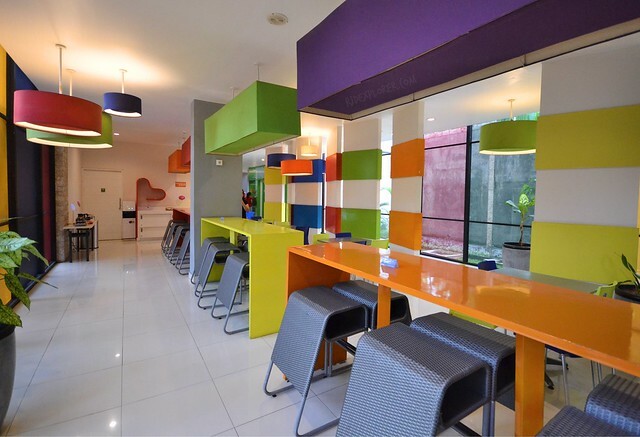 Pop Hotel Teuku Umar loves to utilize all primary and secondary colors. Spacious POP room was waiting for us to rest our tired backs and wakeful minds. The king-sized bed, covered with a wooly comforter and has two pillows, offers too much space for some snooze. The sofa bed, which was actually for extra sleeping space, served as the rack for my stuff. I didn’t know that the ample space is not enough for my travel essentials shoved inside my 32L backpack. 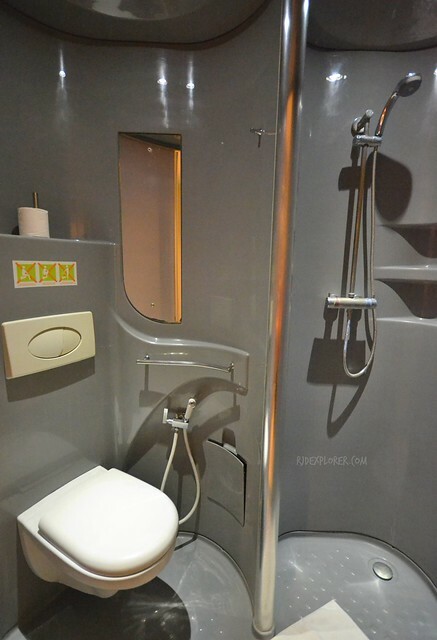 Toilet and shower have a pod concept similar to what I’ve experienced in Japan. The only difference is the shape; circular for POP Hotels compared to the rectangular ones on Japan hostels. Hot and cold shower is available while a small soap and a packet of bath gel are provided. One good thing to note is the availability of a bidet for the toilet. A counter sink, separately installed from the shower, adds convenience if there will be people using both facilities simultaneously. Bottled mineral water is replenished every day and the hotel provides a larger than usual bottled water. Desktop computers for your travel research. Breakfast, they called as morning bites, is included in the room rates. 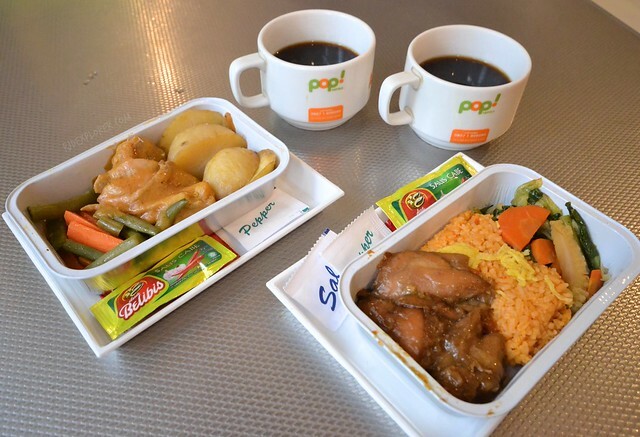 We were surprised to know that meals are served similar to in-flight meals provided by airlines. We found out later that the concessionaire of Garuda Indonesia is also in-charged for POP Hotels breakfast. The are six breakfast options are cheese omelet with chicken sausage, nasi goreng ayam kecap, chicken sandwich, braised tofu, seafood fried-egg noodle, grilled chicken with potatoes. Every item, served from 7AM to 9:30AM, exceeded our tiny presumptions. Coffee and tea during breakfast. Another thing I liked about the POP Hotel Teuku Umar is its accessibility to budget restaurants offering worth-it Indonesia meals. Just 30 meters from the hotel is simple local restaurant offering soto (noodles), and fried and grilled meat. Few hundred meters will bring you to Jebak Restaurant, a place where you can avail Indonesian cuisine on set meals complete with rice, meat, fried tofu, stir-fry vegetables, and krupuk (Indonesian fried cracker). If ever you’ll get hungry at any time of the day, a POP Mart, selling items like cup noodles, biscuits, and bread will be your relief. 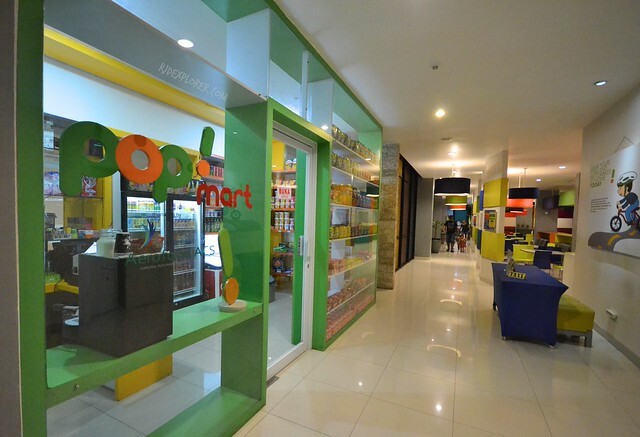 Pop mart for your quick snack and needs. In terms of Denpasar attractions, Pop Hotel Teuku Umar is just an IDR10,000-ride, using Grabbike or Go-jek, from Bajra Sandhi Monument. The monument is rectangular in shape and the architectural design makes the view of all its sides the same. It has the Balinese split gates and a 3-storey main building. Other Denpasar tourist attractions near POP Hotel Teuku Umar includes the Bali Museum and Badung Puputan Park. 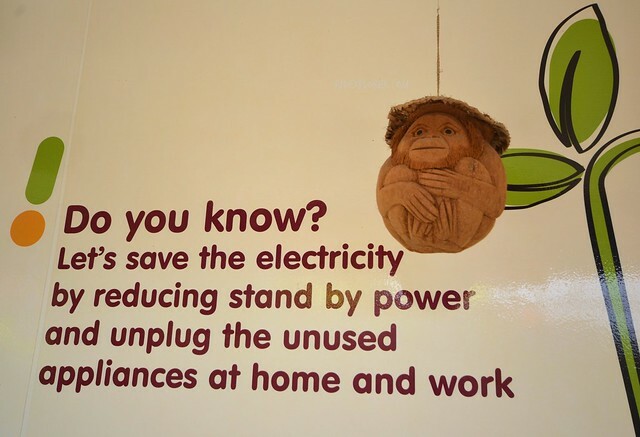 The hotel has several notes like this that promote conserving mother nature. If you are planning to tour around Bali and visit Hindu temples, the hotel is affiliated with a car-rental operator. For a 10-hour tour, rent is IDR500,000 and already includes a driver, petrol, and toll fees. Sometimes, the tour operator also gives discounts to Pop Hotel’s guests. 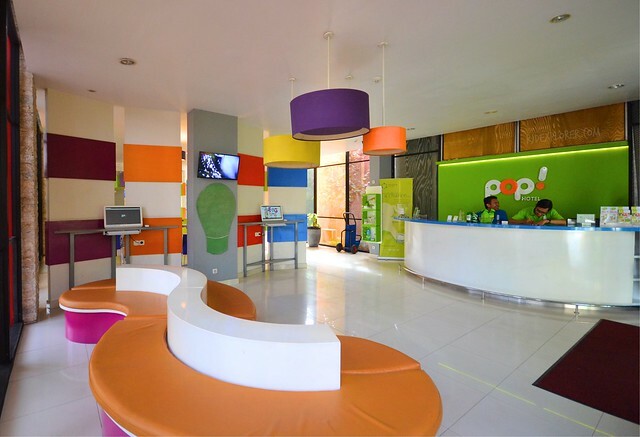 The main concept of POP Hotel Teuku Umar, to promote a colorful vibe while in Denpasar, was indeed felt during our 2-day stay in their location. 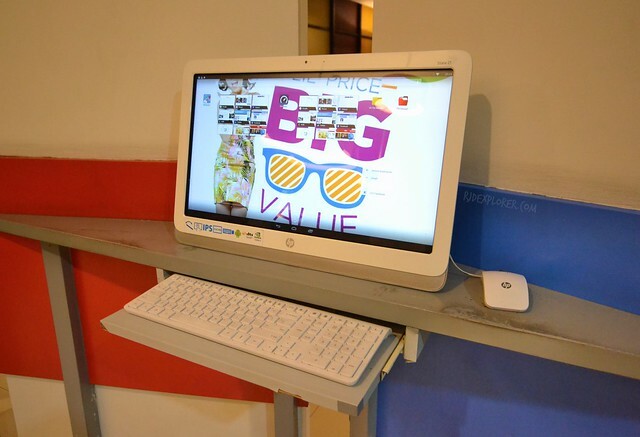 Since the hotel chain has a lot of locations in Bali, we moved to POP Hotel Kuta Beach to make ourselves near Kuta Beach and also the hyped streets of Kuta.